Ooh, I love dry-rub wings! Brian and Marilyn thanks for the review. The first thing I cooked on my new Traeger Lil’ Tex was wings prepared with Pork Barrel All American Spice Rub and finished with Pork Barrel Original Sauce. The sauce/rub combo was a nice balance of savory, sweet, salt and heat. And wait’ll you try the new Pork Barrel Mustard Sauce! It’s a winner! 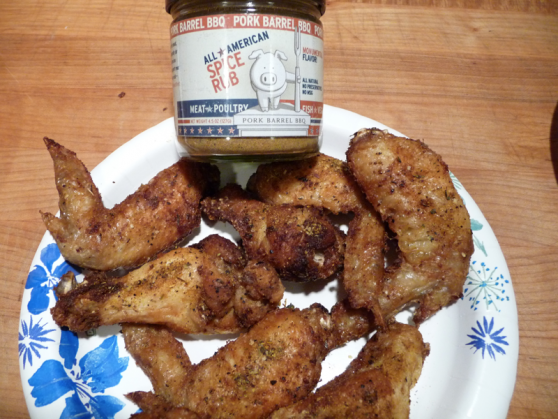 I’d love to see a photo of this rub mixed with the sauce on the wings, that sounds good. 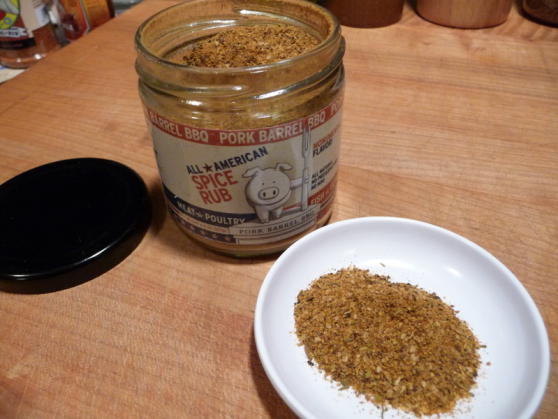 I have used two Pork Barrel sauces and thought they were very good. I will have to try the rub sometime too. Just tried all 3 on a batch of wings tonight: Rub (only), Rub with Sweet and Original Sauces. I used about 4lbs of wings and doubled the rub and EVO amount. Only marinated for an hour which might have some effect but I thought the plain ones could have used a little more rub. Is 1tsp rub correct? The Pork Barrel website uses about 4tbsp for 4lbs. Dont get me wrong, these wings were excellent!! The Sweet sauce was the hit with the 9 and 14 year old, while my wife and I liked the Original better. I think it lets more of the savory rub flavor show through. Both were excellent and top the list BBQ sauce for me esp. with the rub. When you want a break from the heat, order a picnic pack from Pork Barrel! You definitely won’t be sorry. I’m already getting requests to make more tomorrow. Those guys really do make some great sauces. We love the rub just as much if not more. Thanks, Scott, for your great “report” on your successful wings! Like yourselves, we quite often tend to prefer the “original” versions of most offerings. Though not always of course.